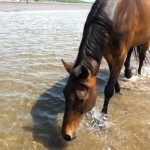 Can your horse stand quietly beside you while you do other things? It’s great to have a horse that is patient and will wait happily beside you while you say, open a gate, answer the phone, chat to a neighbour, but many horses are not patient by nature and so you need to train this as a behaviour. 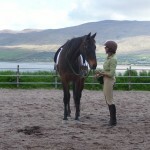 Here Aoife is sitting in the arena and Rua is learning to stand quietly beside her. When he’s relaxed, happy and keeping his distance from her, she clicks and treats to tell him that’s the behaviour she wants. As Rua learns patience, the time between clicks becomes ever longer. 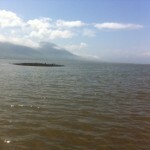 Summer has finally come to Kerry! 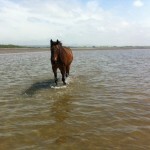 Too hot for riding in the middle of the day, so Newbie and I went for a walk and a potter in the tide. Snacking on the way home! 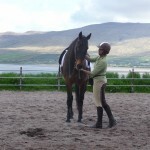 So this year on our clinic with Alexandra Kurland at Tralee, Co Kerry the main theme was working with mats. 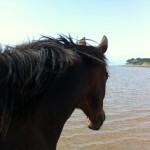 We had five horses at different levels in their training from Frua, who had never stood on a mat to Rocky, a three year old bog pony who could stand on a mat but not stay there, to Newbie who is very mat savvy and two others in-between. For those of you who may not be familiar with Alex’s work one of her six foundation lessons is teaching a horse to stand on a mat. The functions of teaching this exercise are many. At it’s simplest level it asks the horse to trust the handler enough to step on a very different surface, one that usually makes a noise (we use wooden mats to start with most frequently). This is a behaviour that can be shaped but a more effective way is to use the lead rope to help the horse to find and step onto the mat. 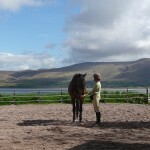 So even before we get to the mat, the handler needs to be able to use the leadrope to ask for forward and back. 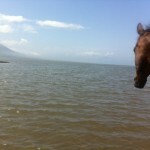 Getting big steps is reasonably easy and often we find that the horse gets close to the mat and takes a giant step forward in order NOT to step on it. Getting small steps back and forward is a lot more difficult and requires good timing and handling skills to be able to release the rope at the start of a movement and click at just the right place! It also requires good balance on the part of the horse. Frua: When Frua started this exercise, he was not at all balanced. He was very downhill, with his weight completely on his front end and was very much inclined to fall out through his shoulder to either side. The first step was to get him to approach the mat in a straight line. 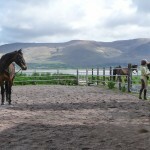 Alex set up a ‘runway’ for him to approach the mats…this comprises two lines of cones in a V shape with the mat at the point of the V.
The runway gives an area for the horse and handler to do some preparation work before approaching the mat. 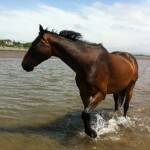 Here we can ask the horse to take single steps forward and back and with each leg. 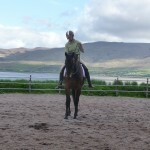 This is a great lesson in control for the handler and balance for the horse. 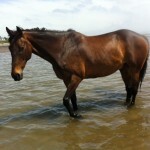 The critical thing is to release when movement starts so that your horse only takes a small step. This is accompanied by a click and treat. 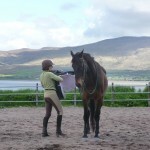 Once this has been performed a few times, the horse can be released to the mat. If he steps onto it….then lots of rapid clicks and treats follow. If he steps over or around the mat, then the backward and forward movements can be used to re-position him. After a bit, the handler walks off casually and circles around to get to the centre of the mouth of the runway. 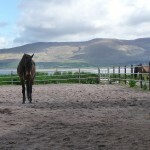 Another function of the runway is to set the horse up to approach the mat in a straight line to make it as easy as possible for him to succeed when he reaches the mat. As he progressed over the three days, Frua’s balance improved. Miriam did a super job of asking him to move forward and back with a light feel. These pics show how much better Frua was in his balance and how Miriam could now feed him in a much more uphill frame. Not the ideal picture (and far from his bestattempt – It’s hard to capture the perfect moment of squareness when you’re taking pics but trying to really concentrate in a clinic…. ), we can still see how much more upright and balanced he has become. 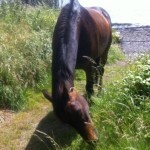 Rocky: Three year old Rocky is a Kerry bog pony. 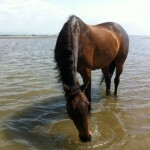 This was his first time away from home since he moved to Marte’s as a yearling. Rocky had just been introduced to matwork but was still inclined to paw and had no duration so this was his starting point. Here you can see the runway. Rocky has not approached in a straight line but has put a single foot on the mat so he gets his click and treat for that! Note how square he is in his stance. Over the course of the three days, Rocky’s mat work improved hugely. Marte has torn ligaments in her knee and should only be walking for a max of 5 min per day. She found it hard to keep up with her quick little man, and so he became a bit grabby for food. Holding his head collar for food delivery was a huge help but Marte was struggling with her balance and so Alex did some work with Rocky. 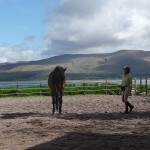 It was great to see how she built duration on the mat with Rocky by placing the rope over his neck initially, CT, then moving back to give him sctriches on his neck (CT) withers, back etc so that he was more than happy to stand on the mat before moving off around to approach again. Not only was he building duration but he was also getting more and more comfortable with being handled all over his body. Alex’s other tip for Rocky was to expand the playground. There were extra mats for him en route to the top of the runway. Then Alex decided it would be nice to add in some heelwork and so she brought in a chair to sit in. When Rocky aligned himself alongside reasonably well he got CTed a few times then Alex stood up and walked off dragging the chair behind her. With a pony who is handled by children, it’s important not to be too precious and particular. He has to get used to getting directions that may be a bit varied with his small size handlers and cope with their bumping and banging! Rocky adapted to this quickly and on the last day he played ‘heel with Marte at liberty. Rocky at liberty with Marte. Now she can sit and rest while still training!! It’s also a great height for food delivery. It’s wonderful when you have extra people around with cameras who are willing to take pictures when you work. 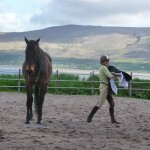 We have just had an amazing clinic with Alexandra Kurland in Kerry and there were several photographers on hand. 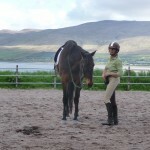 On day one, after a lovely ride on Newbie, we ended up with him standing on a mat. One of the things that I now take for granted with my clicker trained horse is that he will stand and wait patiently while I perform whatever tasks are necessary around him. 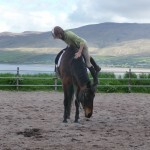 In this case it was simply dismounting and putting the saddle away but when seeing the series of photos, made me think, once again, about how effective clicker training is at producing really well behaved horses! Thanks for a great ride!